The Oxford dictionary says that art is “the expression or application of human creative skill and imagination, typically in a visual form such as painting or sculpture, producing works to be appreciated primarily for their beauty or emotional power.” Wikipedia expands that definition to include technical skills, as in, “Art is a diverse range of human activities in creating visual, auditory or performing artifacts, expressing the author’s imaginative or technical skill, intended to be appreciated for their beauty or emotional power.” Houston’s High School for the Performing and Visual Arts (HSPVA) expands on that definition even further, proudly identifying themselves as a place “Where Learning Is an Art.” But that’s not all that’s expanding for HSPVA. 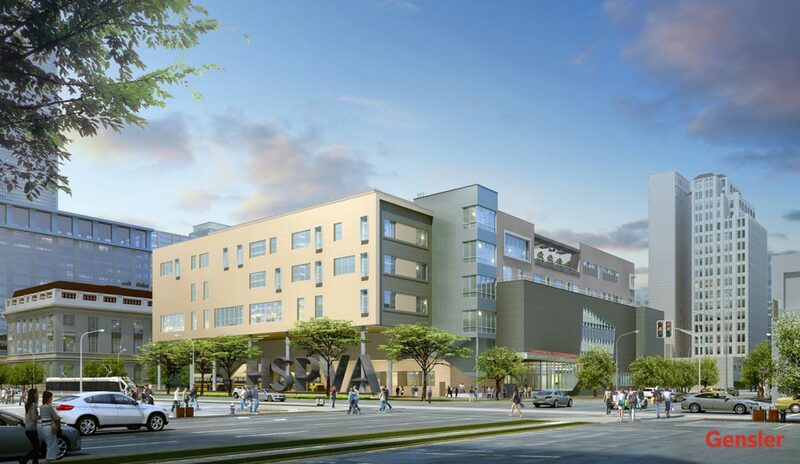 The school is on track to open the doors to a brand new, five-story facility that’s located smack in the middle of downtown Houston in January 2019. Part of the Houston Independent School District (HISD), HSPVA is one of 40 schools designated to be rebuilt or renovated as part of the HISD’s 2012 Bond Program. Houston-based McCarthy Building Companies, Inc. was brought on by the school district to serve as Construction Manager for the project. McCarthy subcontracted JR Clancy to provide an 1800+ square foot SkyDeck™ in the new facility’s black box theater. And JR Clancy, in turn, subcontracted InterAmerica Stage, Inc. (IA Stage) to manufacture and install the SkyDeck™. IA Stage’s Jay C. Hurt, one of several ETCP Certified riggers on the project, was tasked with getting several oversized SkyDeck™ panels into the black box space via second story window. Hurt is known for his expertise in specialized material handling. He says that in order to maintain the highest safety standards on a busy job site – especially one sandwiched inside a busy city’s arts district – knowledge and the ability to communicate that knowledge is key. Hurt has held his ETCP certification for over 10 years. “I was in one of the first groups to get the certification,” he says. Due to the construction site’s close quarters, Hurt wasn’t able to get his forklift closer than 30’ from the building. “We had to [lift the SkyDeck™ panels through the window] over the weekend,” he explained, “because part of my forklift was sticking out in the road.” JR Clancy’s Project Manager, Ryan Cole, also an ETCP Certified rigger, added, “The city wants to maintain traffic flow through the area. We set aside time on an early Saturday morning to off-load the panels and avoid major traffic.” The appropriate lanes were closed and traffic flagged around the construction. The operation required a boom attachment on the forks with a crewmember on the ground attaching panels to the boom one at a time and handling the tagline, while two crewmembers on the second story received the panels as they came through the window at an angle. “All my guys were in retractable harnesses,” Hurt stated emphatically. HSPVA was founded in 1971 and has been located in Houston’s Montrose area since 1981. It is Houston’s first magnet school. Groundbreaking for the $88 million facility took place on December 14, 2014. Gensler, globally-recognized architecture firm and designers of the renowned Houston Ballet Center for Dance, designed HSPVA’s new 168,000 square foot building.